Russian President Vladimir Putin, who will begin his second year of the second six-year presidential term in 2019, will have a busy schedule envisaging dozens of international meetings and hundreds of domestic events. One of the president’s constitutional duties is to deliver an address to the Russian parliament, the Federal Assembly. Last time, Putin made his address on March 1, 2018. According to Speaker of Russia’s Federation Council (upper house of parliament) Valentina Matviyenko, the president is due to deliver his address in the first quarter. Kremlin Spokesman Dmitry Peskov has not announced an exact date, but said it is expected in the first months of next year. 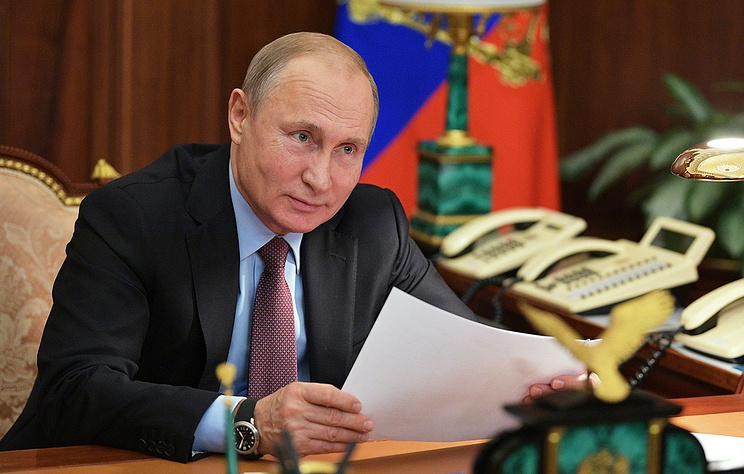 In 2019, Putin won’t abandon his traditional Direct Line Q&A session, which is usually held in the end of spring or at the beginning of summer, and the annual news conference, which takes place in December. There is no doubt that one of the president’s priorities will be implementing 12 new national projects, initiated by Putin’s May decree in 2018. Putin stressed the need to make a technological breakthrough. The president’s schedule may include the 2019 Winder Universiade in Krasnoyarsk, Siberia, on March 2-12. Putin is widely expected to attend the competition. The key international meetings, which the Russian leader usually attends, are the G20 summit, which focuses on the issues of global economy and finances, and the Asia-Pacific Economic Cooperation (APEC) summit. The G20 summit is due to be held in Japan’s Osaka in June. Putin will also have another reason to go to Japan – Prime Minister Shinzo Abe has invited the Russian leader to attend the World Judo Championships on August 25-September 1. The APEC summit will be held in Chile on November 16-17. Other important events will be the meetings in the format of BRICS (Brazil, Russia, India, China, South Africa). The leaders of the five states agreed to hold the next meeting in Brazil, but the exact date is unknown. Another key format is the meeting of leaders of the Shanghai Cooperation Organization (China, Russia, Kazakhstan, Tajikistan, Kyrgyzstan, Uzbekistan, India and Pakistan). Kyrgyzstan, which will take over the rotating presidency in the organization, will host the talks. The program of the Commonwealth of Independent States, the Collective Security Treaty Organization and the Eurasian Economic Union also includes forums. The CIS next summit will take place on October 11, 2019 in Turkmenistan’s capital of Ashgabat. Kyrgyzstan, which will take over the rotating presidency in the CSTO in 2019, will host the next meeting. The Supreme Eurasian Economic Council’s meeting is due to be held in May 2019 in Kazakhstan’s capital of Astana. Another traditional meeting, which the Russian leader never misses, is the forum of inter-regional cooperation between Russia and Kazakhstan. At Putin’s proposal this forum is expected to be held in Omsk in November. The meetings of the Supreme State Council of the Union State of Russia and Belarus are also held on an annual basis. In 2018, the Council gathered in Belarusian capital of Minsk. A milestone in Russian-Belarusian relations will be the scheduled launch of the first unit of the Belarusian nuclear power plant in 2019, which is being built with Russia’s assistance. In late December, Kremlin Spokesman Dmitry Peskov did not rule out that in 2019 the Russian leader, who was invited for the World Economic Forum, could come to Davos. However, no such decision has been made so far. If Putin decides to attend the forum, which is scheduled for January 22-25, this will be the earliest opportunity to meet with US President Donald Trump. In mid-December, White House Spokesperson Sarah Sanders said the US leader was planning to take part in the forum. Earlier, Peskov said holding the next meeting of the Russian and US presidents in Washington under the current conditions was out of question. According to him, the best option was to meet during international summits, in particular, the G20 summit in Osaka. Moscow believes that the two leaders should meet to discuss many unsolved issues, which are important both for bilateral relations and for the entire system of global stability and security. Major international forums to discuss global international issues, which are held in Russia, are popular. The key of them is the St. Petersburg International Economic Forum, attended by the Russian president and his high-ranking guests, is due on June 6-8, 2019. Earlier, Putin offered Chinese President Xi Jinping to pay his visit to Russia during the forum and become its key guest the next year. The Chinese leader accepted the invitation. The Eastern Economic Forum, which is also attended by the president, is due on September 4-6, 2019 in Vladivostok, which will become the capital of Russia’s Far Eastern federal district. Putin has invited representatives of the Association of Southeast Asian Nations (ASEAN) member-states to attend the two forums. Japanese Prime Minister Shinzo Abe may become one of Putin’s first foreign guests in 2019. His visit may take place already in January, although the date is still being coordinated. The two leaders have issues to discuss: at the Singapore meeting on November 14, 2018, Putin and the Japanese premier agreed to step up Russian-Japanese talks on signing a peace treaty based on the Joint Declaration of October 19, 1956. No doubt, Russian-Chinese active privileged cooperation will continue in 2019. According to tradition, the leaders pay visits to each other in turns every year. In 2018, Putin visited China, and therefore in 2019 Xi Jinping will come to Russia. The two leaders will have many chances to meet at various summits. The Russian president is expected to become a key guest and participant of the second international Belt and Road Forum, in April 2019 in Beijing. The Belt and Road Initiative unites the Silk Road Economic Belt and 21st Century Maritime Silk Road projects, which were proposed in September 2013. It stipulates the signing of bilateral memorandums on cooperation with states located on transport Eurasian routes (more than 40 documents have already been signed), along which “economic development corridors” will be established. The first Belt and Road Forum for International Cooperation was held in Beijing in May 2017. The next talks between Russian President Vladimir Putin and Indian Prime Minister Narendra Modi will be held in 2019 in Russia. Putin thanked the Indian premier for hospitality during his New Delhi visit in 2018 and invited him to visit Russia to take part in the 20th annual summit in 2019. Modi accepted the invitation, the leaders said in a joint statement. Putin is expected to pay a visit to South Korea next year and the preparations have been launched, Federation Council (upper house) Speaker Valentina Matviyenko said. The Russian president also accepted an invitation to pay an official visit to Vietnam, but no date has been announced so far. Over the past years, Russia and Turkey have stepped up both their bilateral ties and cooperation to achieve settlement in Syria. Turkish President Recep Tayyip Erdogan held the biggest number of meetings and phone conversations with Putin in 2018. In December, the Turkish leader announced plans to have new contacts in Russia soon. However, Peskov said no agreement on the Turkish president’s visit to Russia had been reached. Another format of assistance for settlement in Syria involves Russia, Germany, France and Turkey. The first such meeting was held in Istanbul on October 27, 2018. Russia, Germany and France also take part in another peacekeeping format on settling the crisis in Ukraine, the Normandy Four group, established in June 2014. In February 2015, the Russian, German, French and Ukrainian leaders held marathon talks, which resulted in adopting the Package of Measures for Implementing the Minsk Agreements, which are a basis for settlement in Donbass. However, of late the participants of the Normandy Four group have not met, but only held phone calls. The leaders have not announced their plans for 2019. Zimbabwe’s President Emmerson Mnangagwa may become one of the first foreign leaders to visit Moscow on January 19. For Putin, Serbia will become one the first countries, which he will visit in 2019. Peskov earlier confirmed that preparations for the president’s visit to Serbia in January were underway. Earlier, Serbian President Aleksandar Vucic said he expected Putin to pay a visit to Belgrade on January 17. The Kremlin has received many invitations for Putin to visit foreign countries. The dates should be agreed on via diplomatic channels. In particular, Putin is expected to pay a visit to Rome in the first half of 2019. There are preliminary plans that the Russian president will visit Saudi Arabia in 2019, but there is no particular timeframe now, the Kremlin said. Cuba’s President Miguel Mario Diaz-Canel Bermudez invited the Russian leader to visit his country in 2019, five years after Putin’s visit to Cuba. Putin’s possible visit to Brazil was mentioned in the two countries’ joint statement on strategic foreign policy dialogue signed in 2017. The Russian president may also visit Iraq, Croatia and Uruguay.